We are all interested in bad movies, inexcusable cinema, worse-than-mediocre pictures, and panther girls, for that is the stuff we use to fill our empty imaginations. You are interested in the unknown, the mysterious, and the punch drunk—that is why you are here. And now, for the first time, we are bringing to you the full story of an evil genius and his empty-headed minions. We are bringing you all the evidence, based only on the secret testimony of the miserable soul who survived a screening. I am that miserable soul. The absurdly low budgets, the forced fisticuffs, the threadbare costumes—my friend, we cannot keep these a secret any longer. 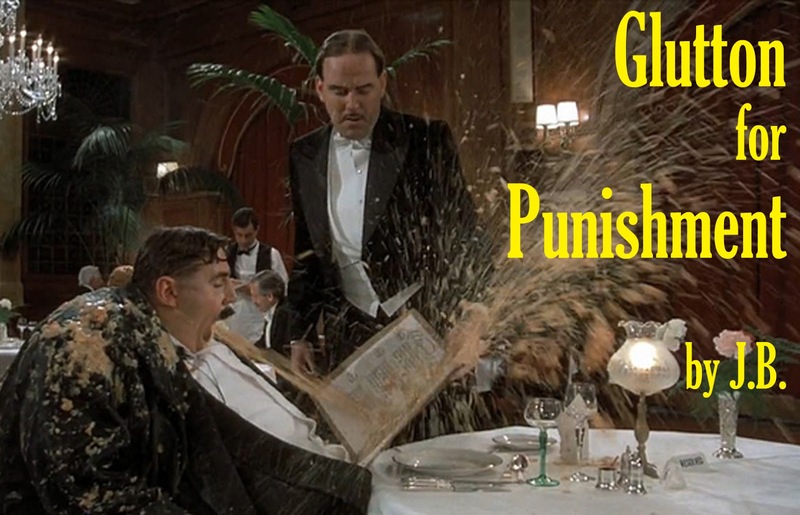 Let us punish the guilty. Let us reward the innocent. Remember, my friends: terrible movies such as these will affect you in the future! 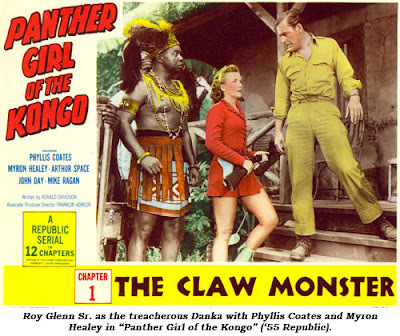 Panther Girl of the Kongo is one of the final Republic Serials. Watching it is to witness a once-proud matinee staple limp to its inevitable conclusion. After producing more than 60 serial titles that provided an endless stream of Saturday morning movie programmers, Republic sold the rights to its extensive catalog to a plethora of local television stations, which would then run the battered 16mm prints on creaky tele-cine machines during an endless stream of Saturday morning broadcasts. What was once the province of children’s popcorn-strewn morning movie theater screenings made a final, death-defying leap… to cereal-encrusted morning television screenings. The good news here is that, because Panther Girl was made so late in the game, Olive Film’s restoration efforts must have been a tad easier because they had newer materials with which to work. The image and sound on their Blu-ray disc is fresh and clean. I doubt if this picture ever looked this good on those original 1950s theater screens stained with Coca-Cola from too many bored, antsy prepubescent patrons. The Plot In Brief: A tribe of African natives is being terrorized by humungous “crayfish monsters,” which the authorities believe to be merely a local superstition. 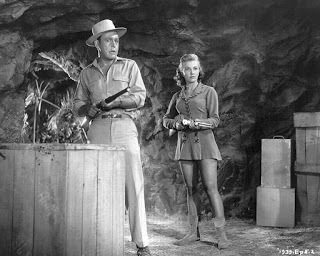 Luckily, the plucky natives battling the very real beasts have International Wildlife Foundation spokes-model Jean Evans (Phyllis Coates) and hunter Larry Sanders (Myron Healey) on their sides. Jean has been given the affectionate nickname “Panther Girl” after successfully battling a live panther and absorbing its soul. You know, as one does when battling live panthers. Then there’s Dr. Morgan (Arthur Space). Dr. Morgan is not a nice doctor, like my podiatrist. He’s more of a mad scientist who is intentionally mutating innocent crayfish to the size of giants and releasing them into the Kongo. 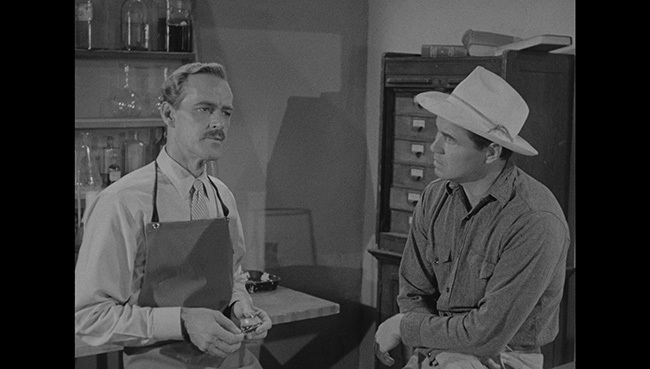 With the help of his two dim-witted yet violent assistants, Cass and Rand (John Day and Mike Ragan), Dr. Morgan hopes to scare away the natives and stake sole claim to the diamond mines conveniently located under the tribal lands. Will Panther Girl save the day? Will Cass and Rand give multiple locals a little chin music? What the hell kind of a hunter is this Larry anyway? One feature of this serial that I found very entertaining is the fact that, in trying to appeal to pre-pubescent boys, the film finds a way to serve up a fistfight in every episode—regardless of continuity, motivation, or plot logic. Bad-guy Morgan sends out his flunkies, and they possess a single way to work out problems or conflicts: their fists. I kept hoping that the series would be bold enough to take this silly trope to its logical extreme and include scenes in which Cass and Rand beat the snot out of incompetent elevator operators, overzealous meter maids, and their own mothers. The villain here has concocted an illogical, overcomplicated scheme. 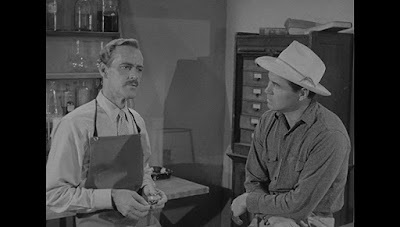 In this way it calls to mind Invisible Monster, the previous serial I reviewed for this column, in which the bad guy wants to rob a bank so he invents an invisibility cloak that requires heavy machinery. In Panther Girl, the baddie just wants to steal some diamonds. This seems straightforward enough—it can be explained with two simple words, “steal” and “diamonds”—and it should not require creating gigantic mutated crayfish, frightening indigenous people with their own legends, or deploying dim-bulb accomplices straight out of a low-rent Fight Club. The actors here all try their best, but they are saddled with repetitive, pedestrian scripts and no budget. Scene after scene is just a variation on one of only three themes: doctor wants diamonds, dumb-Durdens want to punch someone, or Panther Girl comes to the rescue. Lather, rinse, and repeat. Panther Girl of the Kongo is the Taco Bell menu item of movie entertainment. Believe it or not, I was actually interested in watching this one because it stars Phyllis Coates, who had a long, fascinating Hollywood career. To demonstrate the kind of movie autism I apparently suffer from, reading Leonard Maltin’s delightful book Selected Short Subjects: From Spanky to the Three Stooges as a child, the following phrase became embedded into the creases of my then-still-growing brain: “Starring George O’Hanlon and Phyllis Coates as Mister and Missus Joe McDoakes!” Don’t ask me why, but I have been repeating this phrase to myself on a monthly basis for the better part of forty years. The “Joe McDoakes” films were a series of sitcom-like short films produced by Warner Brothers in the 1940s and ‘50s. They’re now largely forgotten, though a whopping 63 films were produced—that’s more than four installments a year for 14 years and NOBODY EVER TALKS ABOUT THEM ANYMORE. Well, the star of Panther Girl of the Kongo is THAT Phyllis Coates—you know, of “Starring George O’Hanlon and Phyllis Coates as Mister and Missus Joe McDoakes!” fame. So I just had to watch every episode of Panther Girl because what better reason is there to screen a movie than because some crazy phrase has been echoing in your noggin for four decades? Phyllis Coates also played Lois Lane in the original television series The Adventures of Superman before being replaced by Noel Neill for seasons two and three. According to the Wikipedias, Phyllis Coates is still alive! 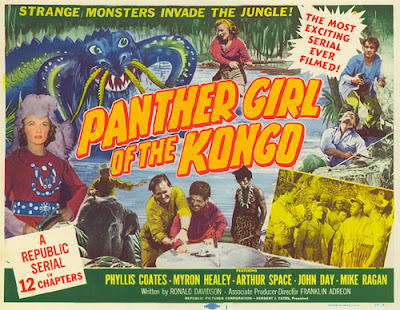 To save money on Panther Girl, Republic Studios re-uses footage from one of its first serial adventures, Jungle Girl. To facilitate the seamless incorporation of the old footage, Phyllis Coates wears the same costume as Frances Gifford wore in Jungle Girl. Did they re-create the 1942 costume… or was Phyllis Coates cast as Panther Girl solely because she was the right size? I’m starting to think that maybe those crayfish monsters weren’t even real. My friend, you have now read this column, based on my own sworn testimony. Can you prove that this film doesn’t exist? Perhaps on your way home, someone will pass you in the dark, and you will never know it, but she may have been, in reality, a panther girl or perhaps… a jungle girl. They’re practically the same thing—and in our enlightened age, why-oh-why would we deny any people their own happiness if it literally costs the rest of us nothing? We once laughed at jungles, Kongos, crayfish, lanterns, tacos, shotguns, rivers, lakes, fistfights, and panther girls of every size and stripe. So much laughter! And now some of us laugh ironically at pretty much everything. God help us in the future. I have nothing of note to say about this particular column, other than I found it charming as heck. At last I can continue to fill my empty imagination with Panther Girls! That taco bell bit has me laughing so hard.